In our first video in this 'making money from your art' series, I showed you how to create and sell digital files of your art in your Etsy store that a buyer could buy, download and print themselves or get printed locally. It's quick and easy. However, not all buyers want to print themselves. Some may just prefer to place an order and have the framed print arrive at their house ready to hang. So in this video, I will show you how to sell prints of your art without having to do the work yourself. It would be time-consuming and potentially expensive to set up this facility yourself. You would need to buy a really good printer, high-quality inks and papers, frames and packaging supplies. Unless you splashed out for an expensive large format printer you would be restricted to only making prints that were A4 or Letter sized and your buyer most likely wants something much bigger. So its much better, quicker, easier and cheaper to outsource the printing, framing and shipping service to the professionals. I sell prints in my store via a company called Printful. 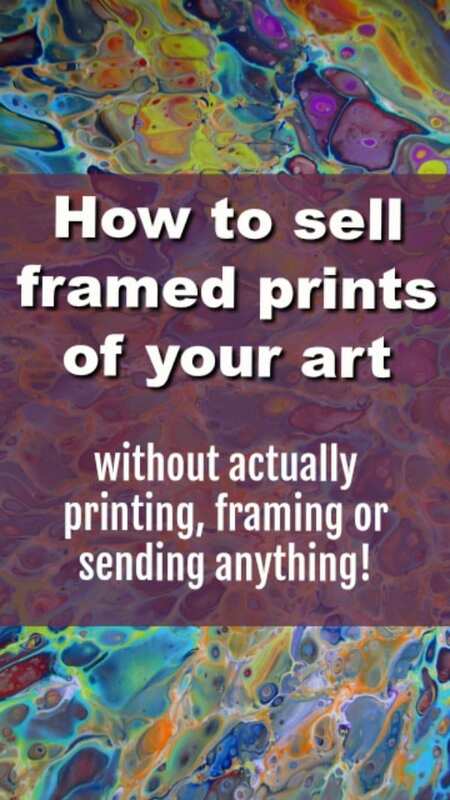 How to sell prints of your art without printing or framing or mailing anything! 1 - set yourself up with an Etsy store if you don't already have one. 2 - go to Printful and set up an account with them here. 4 - create your digital file that you want to be turned into a print. Check out the earlier article on how to do this if you aren't sure. 5 - set up your new product within the Printful dashboard. Again the video shows you how to do it. 6 - check and edit your listing on Etsy and publish the print for sale. 7 - promote your store and products, and Printful processes all your orders for you like magic. The first time you make a sale, you will get an email from Etsy to tell you about the sale (as usual) and also one from Printful. They will invite you to go over to their site and set up your payment details. Payment has already been received from your buyer, so now you need to pay Printful to manufacture and deliver that order. I have set them up with my Paypal details. You only need to do this once, and then check the box to allow them to automatically process orders for you in future and collect the payment from that same method. Then all future orders are dealt with automagically between Etsy and Printful and you don't have to do a thing! Etsy collects the payment, sends the order to Printful, who collect payment from you, print your items, send it to the customer and mark your Etsy sale as completed. You can keep your store open even if you are on vacation knowing orders will still be dealt with on time. Why not just use RedBubble or similar services? There are other companies where you can send them files and customers can order via their websites. However, with these services, you are limited to their format for your store page and can only sell their items. It can be confusing to your potential customers if they have to go to your Etsy store for the original art, RedBubble for t-shirts and somewhere else again to get framed prints or canvases. In my opinion, it's better to have all of your products you offer in a single storefront so your customer only has one link to follow. There is nothing to stop you manually setting up items for sale in your Etsy store and then ordering them from other third party suppliers to ship to you or your customer, but it's just more work for you to have to manually deal with all of these orders. I'd rather list the item once and then let Printful take care of everything automatically for me. Life is busy enough! So I hope that helps with how you can sell framed prints in your Etsy store through Printful without having to print, frame or send anything. It can be a nice little extra sideline on top of selling your original art pieces. In a future video, I will look briefly at how you can sell canvas prints of your art, again via Printful, because the set up process for those is just very slightly different. Controlling the number is easy. They don’t sell them, you do, so you only sell as many as you decide yourself, whether that is one, 100 or unlimited. In terms of quality control, you can place your own order with Printful for the products to test how they would look and be delivered to your customer. Printful also has reviews on their site under the products so you can see what other people (like you, with stores) thought of the quality. How do you get paid – you sell through Etsy and the customer makes payment to you via Etsy orders. Copyright is not affected by asking another company to print for you. You still own and control the full rights to the original and the digital file. Printful won’t steal your design and sell it themselves. Thank you! This page was exactly what I needed to get started selling my digital images online. I am new to this so let that be a warning that I may sound like an idiot. I am an artist that is finally taking the step into online sales. I just opened Etsy (I wish I knew about the 40 free listings before I did) but haven’t posted any paintings yet. I plan to sell originals as well as prints. The latter is what’s keeping my store shuttered for now. I had been taking all my photos with an Iphone 6s (10megapixels, I think). I got scared it would not be sufficient but I’m no photographer so I have no fancy equipment (nor funds to acquire or time to learn it) so I researched until I was fuzzy. I somehow (like I said “fuzzy”, I can’t remember my source) ended up buying a used Canon Power Shot S110. I’m assuming it will be better than my phone for print work. The minimum DPI they require is 150. So my question is how do I know, or how do I set my phone/camera to, the size file I’m sending? I ended up with Printful. Only after signing up with them and connecting them to my Esty shop did I realize they don’t do small prints. No 8×10’s or smaller. I think it starts at 11×14 or something. So my last question is will the Canon take pics big enough for print work that size or bigger? And did I even need the new camera, would the Iphone have been sufficient?